I have no idea what I want to be doing with my life, no idea what my purpose is, and no real sign of a life goal. And yet time has found me. The story begins with the protagonist Hannah Martin on a plane back to her home town of LA after a decade of being one of life’s drifters. She has lived in many cities around the world but never really felt settled or found a career path she was passionate about. On her first night back in LA, she goes on a night out to catch up with some old friends, one of which includes Ethan, her high school sweet heart and first love. At the end of the night, Hannah is faced with two choices, to stay out with Ethan or to go home with her best friend who she is now living with. It’s here that Hannah’s life diverges and she lives out the consequences of both choices, and it’s incredible to see how one small decision, as trivial as where would she sleep that night, yields such different outcomes. The author offers both perspectives in alternating chapters, showing us how Hannah’s life would have panned out if she had picked one scenario over the other. Wow, what can I say. This book was just amazing. From the first line I was hooked and thoroughly enjoyed the narrative of the protagonist Hannah Martin. I will be honest, I was slightly wary having given up on my last two books due to sheer boredom. But I need not have worried, I would happily prescribe Maybe In Another Life to anyone trapped in a reading slump as it really does pull you out of it. For anyone who has watched the movie Sliding Doors and enjoyed the premise, this is the book for you. This story spoke to me. It really made me sit back and reflect on my life and choices that I have made. Like Hannah, I am one of life’s drifters and dreamers, I do have a tendency to sit back and let things happen and reading this book has given me a renewed vision and kick up the bum to grab the bull by the horns. There is definitely a philosophical element to this story and it gets the reader to question things. Are you a believer in fate and serendipity or do you believe in choices and decisions having a direct impact on your path in life. This book will have you pondering these contrasting elements. 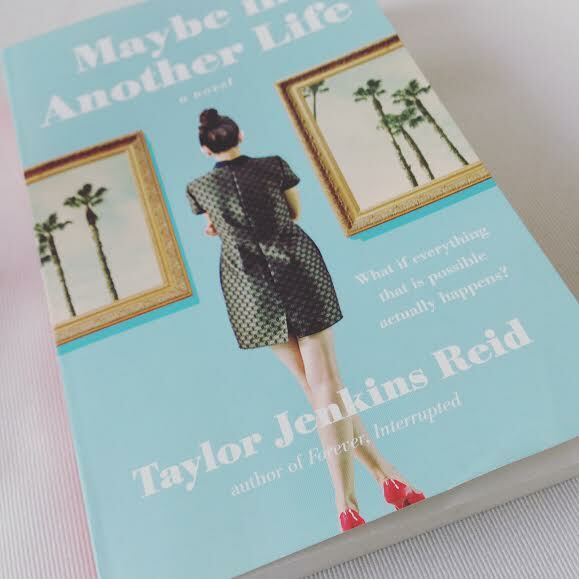 What made this book so easy to read was Taylor Jenkins Reid’s way with words. The book flowed so beautifully that I easily could have read on for another 400 pages. The first thing that appealed to me was the cover when I saw another bloggers review of this book. The cover is so simple and easy on the eye that I just had to buy a paper copy and not a kindle edition. I can quite safely say that this book will NEVER be going to a charity shop, it is a book shelf staple and there it will stay for years to come. I know there may be universes out there where I made different choices and they led me somewhere else. And my heart breaks for every single version of me that didn’t end up with you. So why did I take away 1 STAR if I loved this book so much? Quite simply, it was the ending. I can’t say too much as I don’t want to spoil it for anyone but I wanted and needed a different ending. It’s not that the ending was bad as such, I just saw it panning out differently. I would recommend this book to anyone who likes a story that makes you think and reflect on life, to anyone that is looking for an inspirational read, to anyone who may be at a cross roads in their life or who is looking for a fresh start or a new direction. This book is uplifting, deals with some serious real life issues, etc but has an utterly captivating positivity that runs through out. Below are links to Maybe in Another Life if you would like to add it to you TBR list or purchase a copy. Excellent, beautiful review. THANK YOU for not spoiling anything! I don’t believe in fate. I believe in DOING something that alter the course of your life. But I’m more of a thinker than a do-er which I’m kind of guilty of. Thanks so much for your comment Evelyn. I’m so glad you enjoyed the review, it had been a while since I reviewed a book so I was out of practice !!! I know it’s our choices and decisions that impact our future but you can’t discard serendipity…it has a way of popping in your life when you least expect it. This book looks pretty and sounds like a good read. I completely agree. I believe a little in both and there are things in my life that I definitely attribute to fate. Thank you for an interesting review:)! I haven’t read the book, but as I went through your thoughts here, it immediately reminded me of a great Polish movie, The Blind Choice, by Krzysztof Kieslowski – with 3 parallel storylines shown so differently, all resulting either from catching a train on time, or being there too late. I think we have our destiny and it is up to us to go for an option, and we somehow manage to cross paths with others who would appear at another point in our timelines should we have made another decision in the past.